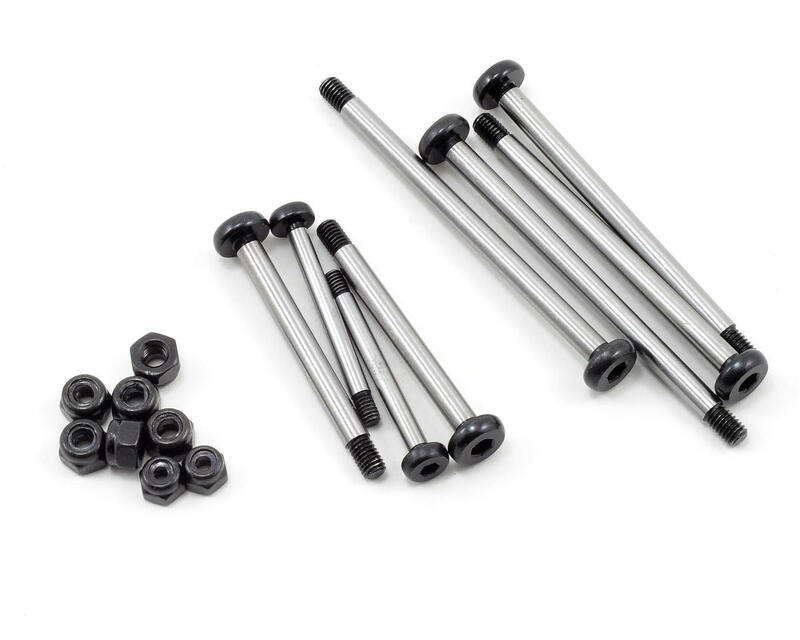 This is a complete set of optional ST Racing Concepts Lock Nut style Hinge-pins. Are you tired of the stock hinge-pins backing out of the A-arms yet? If you’ve been running your Traxxas vehicle long enough, you most likely have already experienced this problem. ST Racing Concepts Heat Treated Polished Steel Lock-Nut Style Hinge-Pin Kit will solve this problem once and for all! Made from CNC Machined high-quality steel and heat-treated for increased durability, these ST Racing hinge pins are polished and ultra smooth! Using Nylon lock-nuts (sold separately) to secure the hinge pin in place helps prevent the pin from ever coming loose or backing out. This is a great upgrade for your Traxxas Slash, Stampede, Rustler and Bandit, as well as the Nitro Slash. Thus upgrade removed so much headache, I would constantly have to tighten down the stock pins cause they would back out every 5 minutes, tiny bit of lock tight on these and never a problem. Best upgrade for the Stampede you can do. Never lose a hinge pin again. These will never unwind like the standard traxxas ones. Have two sets of these one on my slash LCG conversion and rustler basher and they are an awesome upgrade over stock junk. have not bent any yet, but even when I bash I do it within reason! these things are only plastic cars and stuff will break! nothing is indistructable! I've gone through two sets of these pins. They're great for making quick changes to suspension setups, but I would advise NOT using these for bashing. Even though they are heat treated, they bend easier than you would think. Side note: I am pretty conservative even while bashing, but after a weekend-long bash fest I had to replace the front end, and about 2-3 months after that I had to replace the whole set. Rad. These are the heat treated polished steel lock nut style hinge pins I've been seeing in my dreams.. and now i have them.